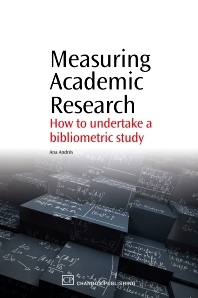 Measuring Academic Research outlines how to undertake a bibliometric study, a topic of vital importance in academic research today. Scientometrics studies assess scientific productivity and can be applied to all disciplines. Many analyses have been applied in relation to bibliometric studies, but few have shown how to actually carry out the analysis. This book provides a guide on how to develop a bibliometric study, from the first step in which the topic study has to be set, to the analysis and interpretation. Descriptive analyses; Author production; Journal productivity; Scientific collaborations; Author citation analysis; Journal citation analysis; Important considerations; Final considerations. Ana Andrés teaches psychometrics in the Psychology Faculty at the University of Barcelona. Her research is focused on methodology for health sciences, specifically on the development and adaptation of assessment instruments used in applied psychology. Also, she is working on methods for quantifying and reviewing the literature of health psychology area, like bibliometric studies.